Welcome to the Talon Mailing & Marketing July 2013 Newsletter. An astounding 54% of online display ads shown in "thousands" of campaigns measured by comScore Inc. weren't seen by anyone, according to a recent study. Don't confuse "weren't seen" with "ignored." These ads simply weren't seen, the result of technical glitches, user habits and fraud. The finding implies that billions of marketing dollars are being poured down a digital drain. Last year, $14 billion was spent on online display advertising, estimates eMarketer, 40% of all online ad spending. Advertisers can blame both technical snafus and more nefarious factors for ads going nowhere. Technical issues include ads being displayed on part of a browser not open on a computer screen—such as when an ad appears at the bottom of the screen and surfers don't scroll down. Another problem: Some ads load so slowly that the Web surfer switches off before the ad comes up, says comScore. And then there is fraud. A significant number of display-ad "impressions" often paid for by marketers are based on fake traffic. Malicious software makes a website think a person is actually on a page and ads are served up to that fake visitor. In other scams, ads show up on several Web pages but they are hidden behind a window on a website that is the size of a pencil point, according to comScore. Tod Sacerdoti, who runs video-ad company Brightroll Inc., puts the proportion of fake display-ad impressions at 30%, accounting for 10%-15% of all display-ad revenue. That proportion doesn't include video, where fraud is a smaller but growing issue, he said. Google has attempted to stamp out fraud, according to ad executives. Google, which owns DoubleClick ad exchange—a marketplace for buyers and sellers of ads—has invested in tools to measure and remove fake Web traffic to ensure ads are "being viewed by real people," said Mr. Sacerdoti. Online measurement tools introduced two years ago, including an ad-tagging system used by comScore have made marketers more aware of how many of their display ads aren't being seen, giving them the ammunition to agitate for change. Using comScore's technology, ConAgra Foods Inc. learned that its display ads were served up in non-viewable areas of the website roughly 30% of the time. ConAgra's ads sometimes reached its preferred demographic—women aged 25 to 54—only about 30% to 40% of the time. Its online video ads were hitting the right target roughly 50% of the time. "We were shocked to see what was out of view and when we go after a certain demo what is not hitting a certain demographic target," said Heather Dumford, global marketing manager at ConAgra, whose food brands include Hunt's, Wesson, Banquet and Bertolli, among others. ConAgra is now demanding that all its display-ads deals come with some sort of guarantee from publishers that their ads will be visible to the human eye and/or its online video and display ads will be seen by a bigger swath of its target audience. Ms. Dumford said ConAgra will make sure that a Web publisher runs ads as many times as it needs to ensure that it gets the correct amount of viewable ads it has paid for. Kellogg Co., similarly, found that "up to half of the ads never come into view," said Aaron Fetters, director of insights for the cereal maker. Last month's study was prepared by comScore, using its ad-tagging technology. It said the study showed wide ranges in how different websites perform when it comes to ad "view ability." Premium sites, that is, more popular sites that have at least $100,000 in monthly ad revenue, generally performed much better than ads that marketers have bought through some ad networks and exchanges, which place ads on dozens of websites across the Web, comScore said. ComScore deems an ad visible when at least 50% of the ad is visible for at least one second on laptops and desktop computers. For the study, comScore said it measured about 76% of the ads directly using the tagging method and projected the remainder of ads because its technology can't measure some of the ads. The study doesn't include ads that appear on mobile devices such as smartphones and tablets, which have their own set of challenges when it comes to measurement and visibility. The Interactive Advertising Bureau, the trade group for Web publishers, declined to comment on the comScore study, saying it hadn't seen it. The IAB said, however, the industry is working on a "uniform way of measuring if an ad is viewable." To improve an ad's prospects for being seen, publishers have been experimenting with new page layouts and site redesigns, the IAB said. In April, Google Inc. said it received accreditation from the Media Rating Council, which also accredits comScore's measures, for a technology called "active view" that allows marketers to "know when and for how long your ads were viewable on a consumer's screen" and allows them to pay only for "viewable" ads. Website visitors are more than twice as likely to click on ads that are viewable for more than one second versus ads that are viewable for less than a second, Google said, based on its data. Marketers have been using the data from comScore and Nielsen Co., which can measure if ads are hitting the target, to tweak ad campaigns, during the weeks and months the ad effort is up and running, by moving ads around a page or to different websites. Unilever said that, after going back to publishers and requesting changes, its ads are reaching between 70% to 80% of its target audience, whereas previously it was reaching just 30% to 40%, as measured by Nielsen. ConAgra has also seen dramatic improvements. "Improvement can be continued through ongoing monitoring, conversations with publishers," said Jennifer Gardner, Unilever's director of media investment for North America. Spark, a media buying firm owned by Publicis Groupe said it is now asking that all its display ad deals come with some kind of "viewable" guarantee. Direct mail is a proven, reliable method that employs time-tested practices to generate substantial results. Social media and web marketing may have their names in lights at present, with a lot of focus shifting to digital marketing. But that doesn’t make it the best option for every audience. For example, only 45 percent of seniors have Internet service, while those who do use email have become savvier at filtering sales messages. Because people readily abandon email accounts due to spam overload, today’s solid email leads can become tomorrow’s waste of time. But next to the ever-changing landscape of digital marketing stands that old faithful: direct mail. Direct mail is a proven, reliable method that employs time-tested practices to generate substantial results. If you can craft a message that creatively places the right information in front of the right person, direct mail can deliver a powerful return on your investment. 1. Make your list and check it twice. Just buying lumps of leads won’t give you the same results as building your own direct-mail campaign. Expert list technology, which filters data based on your specific needs, will produce more refined results than a random blast of data you can only hope is current and correct. “Pray and spray” marketing will never be able to compete with a thoughtfully planned-out campaign designed to target a specific group of people with information that interests them. 2. Make it personal and engaging. Direct mail doesn’t have to be a boring, impersonal card or letter that’s destined for the trash. Thanks to sophisticated marketing software and digital printing, savvy marketers are personalizing messages and engaging prospective customers in new and creative ways. For example, there are envelopes that catch the eye and engage the reader with customized teaser copy, highly customized pieces that can include the addition of handwritten notes and vivid brochures or inserts that showcase the in-depth details of your message. High-quality direct mail is not only packed with relevant information, it also entices the reader with an irresistible deal. By adding value with a discount, bonus gift or free trial, a good piece of mail focuses on the recipient and encourages him or her to say yes. This tangible, real-world value adds weight to any offer and makes a bigger impact than can be achieved through a strictly digital approach. Just because direct mail isn’t the newest technique in the book doesn’t mean it isn’t relevant. It can be a fantastic way to reach prospects who are difficult to reach via email. Even though online marketing is new and shiny, direct mail — that old reliable — is still an impactful way of putting your compelling sales message into your prospects’ hands. Tests have shown that varying the outer envelope can increase or depress response rates by 25% to 100% or more. It’s not uncommon for a marketer to invest a tremendous amount of time, effort, and money in a new direct mail package, and then create the outer envelope almost as an afterthought. That’s a mistake, because tests have shown that varying the outer envelope can increase or depress response rates in an A/B split – even if the mailing inside is identical – by 25% to 100% or more. 1. To tease or not to tease? We use outer envelope teasers because we think the strong teaser we have written will increase response. But there are times when a teaser – even one we think is strong – has the opposite effect and actually decreases response. Some marketers argue that the purpose of the teaser is to get the recipient to open the outer envelope. But a blank envelope from a stranger gets opened every time: you want to know what it is and who it’s from. So why use a teaser at all? Copywriter Bob Matheo says the function of a teaser is to create a positive expectation for what’s inside the envelope. Recommendation: If you can’t come up with compelling copy for the outer envelope, don’t use a teaser. If you have a teaser you think is strong, do an A/B split test of a teaser vs. no teaser. Then roll out with the winner. 2. Who is it from? The corner card – the sender’s name and address on the outer envelope – tells the reader who the letter is from. Let’s say you are doing a mailing to sell subscriptions to an investment newsletter. The letter could be from the editor (Ron Gurian), the publisher (Capital Financial Media), or the publication itself (Tech Stock Update). The corner card copy is not trivial, and should be tested. One publisher had just the name of the editor and the publishing company in the corner card. When they added the name of the publication, it depressed response by 25%. 3. Company letterhead or plain envelope? When the recipient gets an envelope with the logo of a company he does not know, he suspects that he is getting promotional mail and is therefore less likely to open the envelope, read the contents, and respond. To avoid this from happening, you can omit your logo and set the company name and address in the corner card in plain type, such as Helvetica or New Courier. When your company or brand is well known, using your corporate logo may lift response. IT professionals, for instance, are likely to read a mailing from IBM because they think it may be important technical or product news. A number of mailers type the name of the person who signed the letter in New Courier above the logo, so it looks as if it was typed on the envelope by hand. Those who have done it tell me the technique increases their response. 4. Paper stock and color? In a test, a mailer did an A/B split of their control using a kraft envelope vs. a white envelope. The white envelope outpulled the kraft envelope by 25%. This does not mean that the rule is “white always outpulls kraft.” It does mean that outer envelopes matter and you should test. Agora Publishing’s long-time control for International Living mailed in a white #10 envelope. When the control threatened to tire, they revived it by taking the entire package, putting it inside a kraft envelope with a cover letter, and mailing it that way. 5. Size? Test different sizes: Monarch, #10, #11, #14, 6 by 9 inches, and the 9 by 12-inch jumbo. In direct mail envelopes, size does matter, so this is worth testing. A common result is that the jumbo lifts response over the #10, but not enough to make it profitable. Exceptions? Tons. 6. Stamp, meter, or indicia? Conventional wisdom says that best to worst, in order of preference, is a stamp, then a meter, then a preprinted indicia. Some marketers report a lift in response when using commemoratives and other unusual stamps. Another technique I’ve seen work with a jumbo mailing is to use multiple low-denomination stamps to reach the total required for postage. 7. First class or third class? Direct mail that sells a product via mail order is almost always sent third class because of the economics. However, if you are doing lead-generation mailings to business prospects using just a letter in an envelope with a reply card, and your universe is small, first class may lift your response. 8. Window? Should you use a closed-face envelope? Or should you use a window envelope? Test. The advantage of a closed-face envelope is that it looks like real personal or business mail. 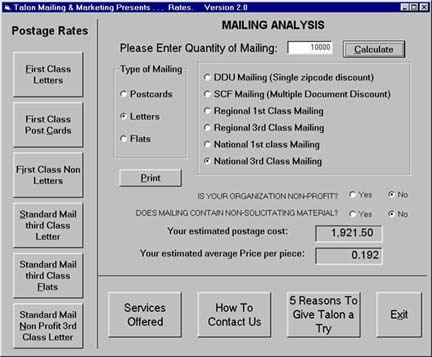 The advantage of the window envelope is that the recipient’s name and address can be imprinted or affixed to the reply element, which is positioned so that they show through the window – eliminating the need for the customer to write in his own name and address. 9. Bulk? Should the envelope be flat? Or should you make it bulky, and therefore arouse the reader’s curiosity, by putting something inside it other than paper? The marketing director for a national nonprofit told me that all of their best-performing packages have “heft” created by a small, enclosed object, such as a crucifix or necklace. Enclosing an unusual object works especially well when you plan to follow up each package with a phone call. A contractor sent a brick with his business card silk-screened on it. When he called to follow up, he told prospects, “I’m the guy who sent you the brick.” He almost always got through. Tuesday August 13th, 2013. Yankees vs. Angels 7:05 PM. asana.com - Asana is the shared task list for your team. The place to plan, organize & stay in sync. skillfeed.com - Professional training video tutorials on creative and technical skills. CreativeCriminals.com - A blog with a daily variety of creative and unique advertisements from around the world. NeverColdCall.com - Bestselling author Frank Rumbauskas shows you the secrets to never cold calling again. funnyordie.com - Funny or Die is a comedy video website founded by Will Ferrell and Adam McKay's production company. chordify.net - Turns any music or song (youtube, soundcloud, mp3) into chords. Play along with your guitar or piano and get into the groove. smore.com - The days of posting a flyer around the neighborhood are over. Smore helps you create amazing pages that you'd be proud to share. is-this-a-scam? - Wondering if an ad, email, or miracle cure is a scam?